The rules for this advanced challenge are a bit different. Your task is to use one expression to create a graph which passes through all five blue circles. Your graph may not pass through any of the red circles. To make it easier to play along, here is a link to the graph. Last week I had the opportunity to sit in on a department meeting with a group of teacher’s from a nearby school. They were debriefing from a Common Core workshop some of the department members had attended, and discussing a few details about their district’s transition (which officially begins next year). One of the teachers (incidentally, the one who invited me to sit in on/crash the meeting) shared her plans for an introductory graphing unit in their Grade 11 Integrated course. The lesson sounds fantastic, and centers around a map superimposed on a coordinate plane. In a nutshell, students will have target, barriers, points to spend (each piece of the piecewise graph will “cost” something, points to earn (by hitting targets), etc. While the challenge above is likely not what my friend and colleague has in mind for her lesson, her descriptions are without a doubt what prompted this idea in my own mind. In the second one, the graph is disconnected, but it’s a single expression, so it still counts, right? 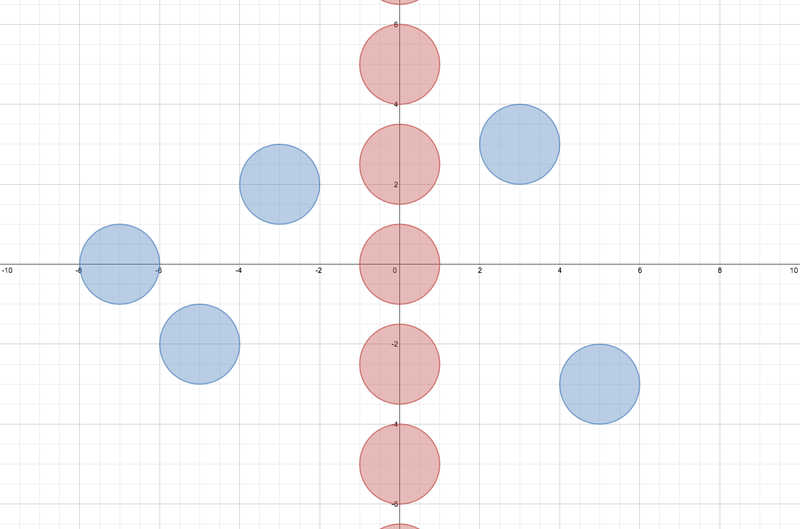 Here is a polynomial that goes between the red circles (rather than around them) and which passes through the center of each blue circle. I love the elliptic curve solutions, though.